She visited here maybe 40 times in her life, coming for the entirety of 16 summers, plus on the annual trips up to open our cabin in the spring and to close it in the fall. She made her final visit here last April, and she even felt strong enough to take a staggering little stroll through her favorite routes in the weeds. Two months later, we brought her ashes back to scatter in those beloved weeds. She was our sweet little old girl, our cat, Cassie. Cassie didn’t just travel up here from downstate though—in her lifetime, Cassie visited eight states. She never traveled by air, though her orange tabby brother had done so twice as a kitten, before it was clear that he needed a playmate; we drove Cassie home, tiny and trusting, from the shelter. After that, she traveled by car many times, riding in the passenger seat or, sometimes—if her brother hadn’t claimed the spot first—on my lap, her soft black fur always within reach. She had a practice of barfing within the first and then (how did she know?) the last mile of any trip, but in between she was calm; we always traveled with a litter pan, as well as paper towels for that first and last mile. I would often sing a made-up song for her. It was to the tune of “Clementine” and involved her many adventures with road trips and open-door greetings. Over the years, her adventures included visiting the guest rooms of friends and relatives, walking leashed in neighborhoods and down our lane here, sunning herself in patches of myrtle, needing rescue from perches in high places—a motel shower, kitchen cabinets—and watching the world go by from a succession of screened porches. Her porch in Benzie was her favorite, though. Here, she saw deer. She slept in all-day sunbeams, and on hot days, she did her “otter thing,” stretching out on her back. She twitched her behind while watching chipmunks on the steps. She watched birds on the wire. And for the last three summers of her life, she found a vantage point from which to watch baby robins hatch, grow, and fly away. She just watched the birds, but her always-sweet demeanor could not mask the fierce hunting instinct that she and her brother had for indoor mice and the occasional bat (always tested for rabies, always negative). And there is much she never even knew or realized about our life Up North at the cabin—she never noticed, for instance, the water softener (her fragile kidneys demanded bottled water) or the changing refrigerators (all kept her leftover-fish-dinner treats the same temperature). She never knew that she had Benzie cousins: friendly cats who wander a floor at Paul Oliver Memorial Hospital, cheering up the residents. Since she didn’t see the appeal of the beach at Point Betsie on her one visit there, her only presence at a beach wedding later on was a photo stuck in the sand. Cats outlive their kidneys is how I understand it, and kidney failure is often their fate. This is also true of very big cats, including the tigers, lions, and cougars at the Exotic Feline Rescue Center in Center Point, Indiana, where I am a tour guide when we’re not in Benzie. The Center has lost a number of older tigers and cougars to renal failure, usually around age 20—a good, long life, but always a sad goodbye. The same was true of our 16-year-old Cassie. We eventually added subcutaneous hydration to Cassie’s daily routines, a new skill for us. “Sub-Q” injects fluid into the space under the skin (subcutaneous tissue) from where it can slowly be absorbed into the blood and the body; it just takes a few minutes. I can’t count the bags of fluid that we went through, but it was easy, and each little dose kept her comfortable as her kidneys gradually began to shut down. Cassie seemed to know that the process was helping her: she hunkered down—even purred—each time. On her last visits to Benzie, we brought fluid bags, along with many meds and her latest favorite canned foods. Here, we did the hydration with the bag hooked high on the screened porch, so that Cassie could sit in a favorite sunny spot or sometimes on Jack’s lap. Cassie was a hospice cat for most of her last year. She made it to 16, with the help of many professionals, including those at Platte Lake Veterinary Center, where two summers ago the doctor offered a shot that “might give her one more comfortable day” after what had seemed like the last and final crisis. Three days later, a Sunday, the scene was repeated at Bay Area Pet Hospital after another “last” crisis… but our defiant Cassie lived comfortably for 40 weeks more. We helped to reduce her small world into something even smaller, making warm beds closer to her food dish. She ate lots of fish. She had lost her brother two years before, and a gentle new kitten slept with her during her last months. Her final short visit to Benzie, to open the cabin last spring in April, was a montage of her life here. She slept in slanting sunshine. She walked in the weeds—leashless now, since she wasn’t going anywhere fast. She climbed up a stepstool beside the bed and slept with us. She looked out the screen to the winding lane and the lake beyond. She watched chipmunks. She had ceased barfing in the car, and her last road trip home to Indiana was peaceful. She was very tired. Not long after, finally too weak to do anything but sleep, she gave us the sign that everyone had told us we would recognize when we saw it—she crashed into a corner of a closet; she was telling us that she couldn’t give any more, that she was ready to go. She managed to purr as I held her on that last morning, and she died peacefully on Jack’s lap at the hands of a kind doctor. Cassie’s ashes came back to Benzie last summer, scattered along her favorite walks in a place that she didn’t know by name but had come to love for 16 summers. 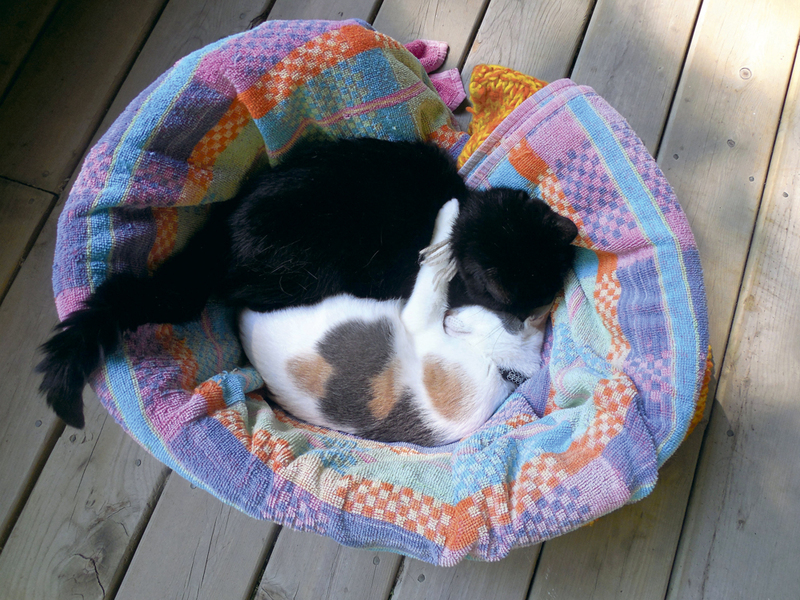 Photo caption: A gentle young kitten slept with Cassie (black) during her last months. Photo courtesy of Beau Vallance.